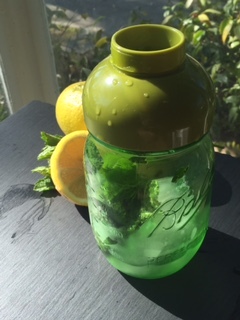 Add mint, honey and lemon juice into a cocktail shaker or pint glass. Use a muddling tool to grind your ingredients. Just enough to release the flavor of the mint into the lemon and the honey. If you don’t have a muddling tool, the dull end of a butter knife will do. Pour two generous shots of gin into the shaker, and give it a swirl. Fill two rocks glasses with ice and add 4-6 drops of the lavender bitters into each glass. Strain into the rocks glasses and top off with club soda. 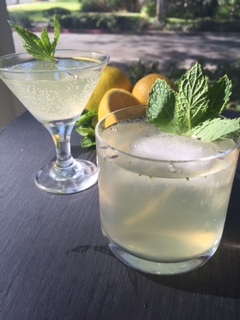 Garnish with a sprig of mint and enjoy! I found this cocktail to be light and refreshing and not too sweet. If you prefer a drink that is more on the sweet side, add 4 Tbsp. (2 per serving) honey or more to your liking. I hope you all make a reason to celebrate this weekend and that you will drink responsibly, because seriously, trips to jail, the E.R. or the morgue are all total buzzkills. Swearing Mom out! Previous Post Gingeriffic Apple Juice!